← PINK OUT GAME FRIDAY, OCTOBER 7! LOWE’S FUNDS LIBRARY MAKEOVER AT CHS! 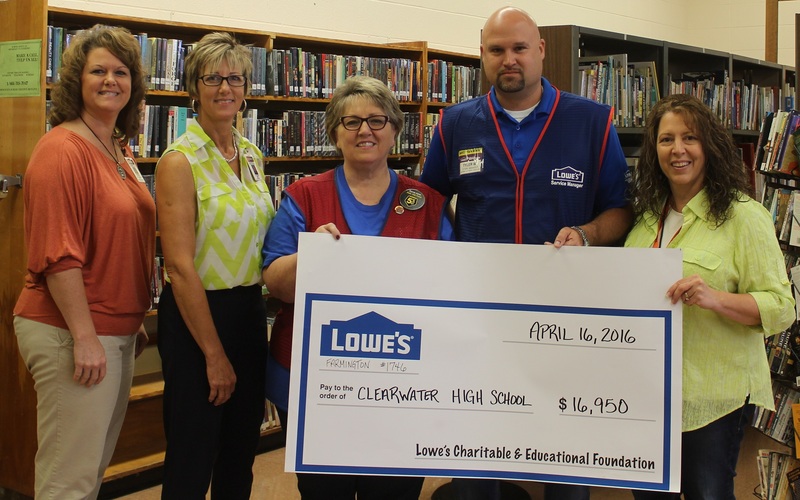 A new look is in the future for the Clearwater High School Library thanks to support from Lowe’s Charitable and Educational Foundation (LCEF). The project, “Transforming Library Space for School and Community Engagement” is designed to provide the CHS Library with an inviting atmosphere and flexible space that accommodates a variety of student and community-centered activities. This flexibility will be possible with new shorter, mobile bookcases that will allow accommodations for book club meetings, author visits, and community events. A new circulation desk with cabinet space will create a pleasant entry point allowing a clean line of work space to greet patrons and attend their needs. Clearwater R-1 Superintendent Deborah Hand, High School Principal Teresa Smith, Lowe’s ProService Sales Specialist Jenny Sadler, Lowe’s Farmington Store Manager Tyler Walton, and High School Library Media Specialist Mary Bangert gather in the Clearwater High School Library as a check for $16,950 is presented to the school. The grant announcement was made last spring and the project is getting underway during the 2016-17 school year.